Ladies, what’s your dream guy? Tall dark and handsome, intelligent, funny, romantic, understanding, a great dress sense, sensitive, creative, loving, thoughtful, athletic, kind, ambitious, a good listener, quirky, charming, honest, attentive, adventurous, a fireman, a pilot? Now i’m sure you picked out at least a few from that list, but I left out one crucial point…… RICH. Wealth and money is a huge deal breaker for women finding the ideal guy in China. Of course i’m not saying this applies to everybody, as that would be a slight generalisation for 1.3 billion people. But this is definitely a strong mentality here, and about 95% of the locals I have chatted with have told me that a man with money is an important factor, if not the most. No pressure guys. Cutting to the chase much. I don’t necessarily agree with this mind set, but I can understand. Every culture has it’s own values, traditions, customs and things that are considered important/unimportant. With China’s massive population, competition is extremely high. Money is seen as the answer for stability, the “best” education, a good lifestyle and a better future. Unfortunately the decision isn’t always made by the person themselves; parents also have a huge influence on who they can or cannot be with. 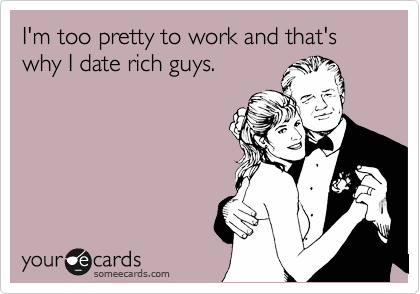 On the flip side, men with a house, money and a high paying job feel they won’t have too much of a problem finding a girl, therefore they can “afford” to be extra picky. This leaves women feeling pressured to compete with other girls, and find a husband before they get “left behind”.